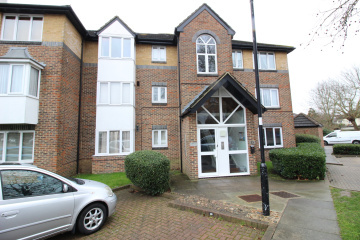 As vendor's sole agents, we are pleased to offer this ground floor studio flat with a fitted kitchen with appliances and a white bathroom suite. Situated in a cul-de-sac location within three-quarters of a mile of Worcester Park's shops, restaurants and mainline station giving access to Waterloo in 25 minutes. Entryphone, electric radiator, built in storage cupboard, additional shelved airing cupboard housing hot water cylinder tank. Into double glazed bay window, night storage heater, range of fitted wardrobes providing hanging and shelved storage space. Fitted with a range of high and low level cupboards and drawers, roll work top surfaces, inset single drainer stainless steel sink unit with mixer tap, double glazed window above, fitted electric cooker with extractor hood above, fitted washing machine and upright fridge/freezer. White suite comprising panel enclosed bath with mixer tap and shower attachment with curtain and rail, pedestal wash hand basin, low level W.C., extractor fan, part tiled walls, tiled flooring.